Scroll down for more info about the products. Luonnollinen ja käsintehty parranhoitopaketti Suomesta! Here is the Beard Care Package for the serious Beard bearer! If you are not currently grasping the essence of manliness that is your Beard. Well, frankly. This is not the place for you. Mustache wax tames your Stache and keeps it looking on point for the whole day. This product makes your mustache shine while still looking natural. Lanolin have also other proven benefits, for example it moisturizes your skin. 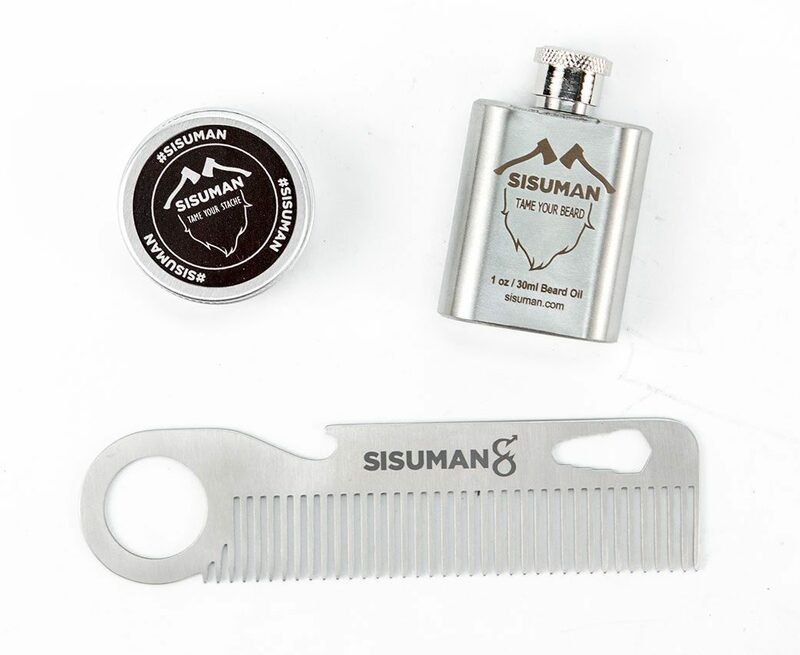 SISUMAN Mustache wax is a fairly stiff wax with good hold, works good for the average user. A good allround wax that fits most styles! This oil keeps your beard and skin moisturized and healthy while your beard is easy to manage. It also prevents inflammation and nourish the skin, and yeah it smells good too! Our oil is a bit thicker than many others on the market an this makes the oil to last long and work good in all climates. Hair and Beard Comb made in 1,5mm Stainless steel. Lasts at least a lifetime. This comb might be a bit more rough to really sensitive beards than a comb made of wood or plastic. 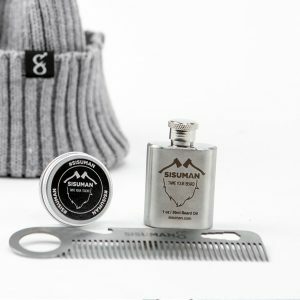 We also have the Beard Care Package as a Hat Combo, Check it here! Sisumanin tuotteista kaikista tutuimpia miulle on partaöljy ja viiksivaha, käytänkin molempia päivittäin. Oon huomannu, että niillä pysyy tuuheekin parta ja viikset ojennuksessa + tykkään partaöljyn metsäsestä tuoksusta. Tyttöystäväkin on ollut tyytyväinen, kun ei enää näytä tai haisekkaa maantierosvolta! Riktigt nice paket! Snygg helhet, snabb levereans (2dagar), bra produkter, Sisuman = kvalité! We strive for greatness, so you will always receive quality stuff from us. If there are any questions at all, don’t hesitate to contact us and we will help you! We hope that you enjoy visiting our store and that you are delighted by our Sisumen stories.